The crew over at Chicago Distilling Company has recently created a couple canned cocktails to help get their line of spirits into the hands of cocktail lovers in places where they may have had to previously settle for beer*. Their canned “Gin and Tonic” begins with their flagship Finn’s Gin. 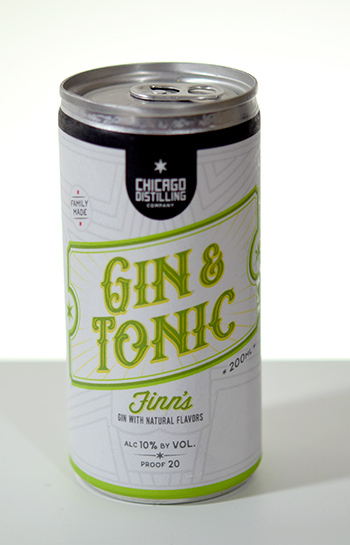 It’s then canned and bottled, ready-to-drink— Finn’s Gin and Tonic comes in at a relatively strong 10% ABV in a 200mL can. Poured, there’s a rapid effervescence which scintillates the nostrils— I get notes of cardamom as they bubble away. However, Finn’s Gin and Tonic rapidly simmers down. A couple of geyser like eruptions of carbonation remain, but with few bubbles adhering to both the sides and the bottom. The aroma, as when it bubbled upon first pour, is pleasantly contemporary and spice-forward. White cardamom pods freshly cracked open— Finn’s Gin and Tonic suggests a cardamom soda at first. Tasted, this G&T has a bit more complexity. Small tight bubbles at first on the palate. They don’t last very long, but certainly there’s a nice fizzy texture at first. Finn’s Gin and Tonic has a hint of lemon early, then a surprising mid-palate note of dried spicy red pepper (the taste, not necessarily the heat) along with a good deal of cardamom. The finish has notes of roasted and slightly blackened Serrano pepper, and flamed orange rind. Finn’s Gin and Tonic has quite a nice flavor about it; however, I think that those looking for a more traditional take on the ready-to-drink Gin and Tonic may find themselves a little lost. Finn’s goes light on the juniper— incredibly light. It hovers as a background note, while allowing some of the more contemporary spices to hold court. It’s a refreshing and deceptively complex G&T. Though you may not want to ponder tasting notes or complex spice profiles at your next BBQ— Finn’s Gin and Tonic would afford you that opportunity. But in all seriousness, ready-to-drink gin and tonics tend to veer towards the classic side of gin. If you’re a fan of contemporary gin, Finn’s G&T is a drink you want to go pick up. *No judgment, if that’s your thing.